Rocker Bret Michaels' father says his son, being hospitalized in Arizona for a brain hemorrhage, has spoken to him on the phone. "Extra" spoke with the former Poison frontman's father, Wally Sychak, at his home in Pennsylvania. Sychak said the ailing "Celebrity Apprentice" contestant is improving. "Well, the fact that he was talking to me, and giving me information, I thought that was great. I understood that this was a terrible ordeal that he was going through. We're not getting information right now. I guess no news is good news," Sychak said. When talking to his son on the phone, he said, "He sounded a little slow, but fine. He was talking, not as cheerful as he usually is. But I guess he is under sedation. But he understood what he was saying and knew me. Everything seemed good that way." He also said Michaels is starting to move his limbs again. "They say he's moving his arms and hands. The best as they could expect at this time," his father told Extra. "Celebrity Apprentice" creator Donald Trump, who usually shows his contestants tough love, is also showing his genuine concern for Micheals. He appeared on NBC's TODAY Show this morning and called the rocker "a really an amazingly competitive guy" and said that he feels guilty for being so hard on him. "Celebrity Apprentice" involves a tough schedule, Trump admits. "He was working 24 hours a day and it's tough," he said. "He would work so hard and I really gained respect for him." Michaels, who is competing to raise money for his charity, diabetes research, has served as one of the season's most outspoken celebrities and has so far avoided being fired in the boardroom. Trump also mentioned that Michaels was really distraught when he found out that his daughter also has diabetes. As for the competitive reality show, it must go on, and the final live episode will scheduled to air in four weeks. Thanks to taped reality TV shows, Michaels also remains as a contestant to become Trump's next "Celebrity Apprentice." But Trump isn't too concerned about that right now - just Michaels' recovery. "Forget the show, he's such a nice guy. I just hope he makes it," he said. Michaels' New York-based publicist, Joann Mignano, confirmed on Friday a report on People magazine's website that said the former Poison frontman was rushed to intensive care late Thursday after a severe headache. Doctors discovered bleeding at the base of his brain stem, the report said. Some of Michaels' "Celebrity Apprentice" teammates took to their Twitter accounts to express concern for their co-star. Sharon Osbourne wrote "I'm thinking of you and wishing you a speedy recovery" to Michaels on her Twitter page. Holly Robinson Peete acknowledged that Sunday night's episode was a big win for her charity, but added that she will feel "MUCH better when Bret does." Michaels had an emergency appendectomy April 12 after complaining of stomach pains before he was scheduled to perform at Sea World in San Antonio. Michaels later wrote on his website that although the surgery "has taken its toll," doctors expected him to make a full recovery. Before joining the third season of "The Celebrity Apprentice," Michaels starred as the lothario on VH1's lusty reality dating series "Rock of Love" from 2007 to 2009. For three seasons, Michaels searched for the women of his dreams amid a sea of implants, tattoos and thongs. 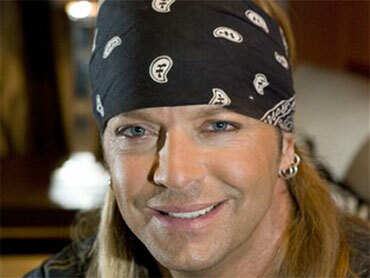 He also served as a judge on the fifth season of the USA singing competition "Nashville Star" in 2007.